This is a forum for all people who wants to share their problem to somebody they didn't know and wants an advice from other people who undergone the same situation. Do you believe in forever? Is psychology supports this idea? Many people believes that there is forever and those only who have a love problem doesn't believe in this idea. I have situation whereas it pertains with this idea... forevermore...? There is a girl who has a boyfriend now who is once became her ex. Why did they break-up then? Well it is because of long distance relationship. After the break-up, the girl found a new guy while the boy stayed single because he chose to be. Despite of their separation in terms of relationship, they still have a communication (texting and meeting up), they are still sweet whenever they talked to each other or hang-out--that triggers the confusion in the part of the girl. The relationship of the girl to her new found guy stayed for 7 months, they broke up when the new guy went to Bohol and the girl still being confused to her feelings toward her ex. In those times that the new guy is in Bohol, the girl starts to re-think if what she felt to the new guy is really love or just a fancy. The answer came up with just a couple of days, she confirmed to herself that the she still love her ex. And so instead of lying to her new guy, she talked to him and they parted ways as single again. The girl didn't said to her ex that she love him, the guy simply courted her and they became an item again. So, after reading the story, what can you say about the term "forever"? Is there such a thing? And lastly, what psychology supports this idea? hhhhmmmm.... actually I do not believe in such things unless I experienced it. Based on my own opinion, our believability in forever depends on what that persons believes. In philosophy, we have said to be two categories of man the realistic who believes on what they felt, experienced or sensed and the idealistic who believes in a concept even though they didn't really encounter/experienced it or believing in the concept even though that is not REAL according to realistic's perception. FOREVER is just a word and will remain as a useless word if we don't hold on to its meaning. So, for those people who says "there is no such thing as Forever", let me ask you?? have you ever been in ove? coz if not, you have no rights to say such thing..
yes, i believe in forever because if you have a big problems or broken hearted GOD is always there, GOD never leaves us. We have to know that "FOREVER" isn't necessarily realistic. We love a person not because forever exist. yeah your right we can love without believing that forever really exists. Admin wrote: yeah your right we can love without believing that forever really exists. In your opinion, does forever really exist? For starters, I don't believe in forever in terms of BEING LOVERS, but I BELIEVE IN FOREVER WHEN IT PERTAINS TO BEINGS AND CREATIONS. I did not just say that because I'm a cynic, it's just that love is somehow a chemical reaction---A reaction that can result numerous facets of love. You see, there is a hormone in our body that results happiness to our system. That hormone somehow reacts in situations like seeing a crush or just eating our favorite food. Did you know that if that hormone stops in reacting we could die? That is the primary reason why the statement "I WILL DIE IF YOU WILL LEAVE ME" was created, because we can really die out of being unloved---I'm not just referring to lovers okay? I'm referring to different facets of love. So you see, there cannot be a forever thing in lovers because we can feel in love with numerous of persons, SAME REACTION IN DIFFERENT PERSONS---that is what we feel in terms of beings. For your second question, well i think the "Color Wheel of Love", a theory back in 1973, proposed by Lee, can support the idea of forever. thanks for your output Xyn, in addition to that, we feel in love because we think need to be loved. there's is something to inside ourselves that gives as discomfort and urges us to find someone to love. its ourselves who controls and diverts these urges onto whom or what we will divert those urges. some people find someone for them to give that and others find contented to their selves or perhaps divert to some things and activities so that they will less feel those urges. SAME! I believe in life time, but not in forever. I think there's no such thing as forever in this world. Everything here is temporary or has an ending. I can only relate that word with God. God's love for us is forever. I do believe in forever, until I died a little bit inside. please fix my broken insides. "For that is what God is like. He is our God forever and ever, and he will guide us until we die." Admin wrote: Do you believe in forever? Is psychology supports this idea? Many people believes that there is forever and those only who have a love problem doesn't believe in this idea. I have situation whereas it pertains with this idea... forevermore...? Forever is just a word and it doesn't define the word "LOVE". no one will can deny that the love of God takes forever and that is real!!! I DO BELIEVE IN FOREVER ! <3 'COZ I HAD MY KA-FOREVER. AHAHAHAHA! CHOS! ....... Forever is a lie. 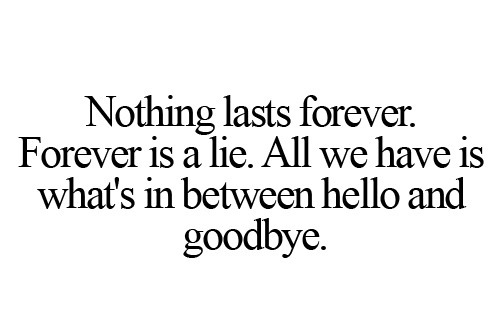 ...........what' is between Hello and Goodbye"
camsnava wrote: I DO BELIEVE IN FOREVER ! <3 'COZ I HAD MY KA-FOREVER. AHAHAHAHA! CHOS! literally there is no such thing in this world that lasts forever except for the love of our God. if you believe on forever what does its difference between eternity and infinity?